The Annual Benefit Campaign allows Ballet 5:8 to raise the funds necessary to provide innovative, breathtaking performances and high-quality dance education to the many communities we serve. Our current season comes with an increased need to expand our programming in a new building! Ballet 5:8’s new, state of the art studios serve hundreds of students and their families each season. You can leave a lasting impression on Ballet 5:8’s community for the next 10 years by sponsoring one of our new studio spaces! Studio 1: Invest in our professional company, advanced training programs, in-studio outreach performances, and in-studio performances for the School of the Arts. Our professional dancers have the space to dance bigger and rehearse multiple casts at the same time. 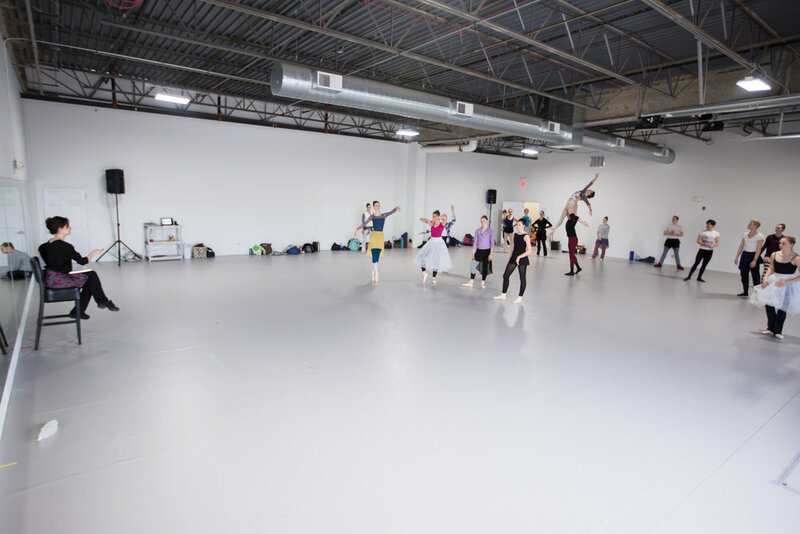 Studio 1 can also double as a black box theater, which will allow us to make innovative storytelling and breathtaking dance more accessible to our community in the South Suburbs of Chicago. Studio 3: Invest in our advanced training programs. Many of our dancers take strengthening and cross-training classes in this studio such as Yoga and Pilates. They are also hard at work with their technique, which will help them become stronger dancers. Our children & youth division is also served by this studio, allowing our ever growing tap program and boys dance to have plenty of space to dance around! Studio 4: Invest in our and children and youth division students. Many students are learning the formative steps of ballet in this studio! It also serves students pursuing other forms of dance such as modern, hip-hop and tap. Studio 6 (Cross-training): As the name implies, this studio space is dedicated to cross-training. Invest in the health and well-being of our dancers as they work other parts of their bodies to be strengthened and prevent injury. This space also allows our Physical Therapist from Athletico to have a dedicated place to meet with our company dancers on a weekly basis. Wanda Bowman’s investment in Studio 2 where many company and trainee classes and rehearsals are held as well as the training of our advanced program students. Olivier & Naomi Morin’s investment in Studio 5 (Pre-ballet) where many of our youngest dancers are learning their first ballet steps! A plaque outside your sponsored studio that will be in place for at least 10 years. Thousands of students, families, staff, and community members will see your investment in Ballet 5:8. If you own a small business it’s a great way to boost brand recognition! Your name on our printed marketing materials for shows. Ballet 5:8 tours all over the country, and so will your name or business as you will be listed as a Studio Sponsor on our show posters and programs. Your name on our website footer. Again, another amazing way to boost brand recognition for your company. Our website has currently seen 104% increase in unique visitors in the past year, that’s 18,000 more people looking at us! Shout outs on social media or email campaigns several times a year. A lasting impact and partnership to make honest, relevant, and breathtaking dance possible each and every day. Thank you to our generous partners that have come alongside us to achieve 82% of our fundraising goal! We are in need of the remaining 18% by June 1, 2019. Interested in learning more about how you can partner with Ballet 5:8? Click here to go to our support page or click below to give a gift today.